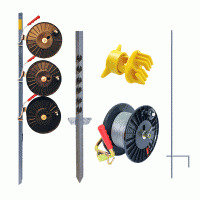 Keep life simple with our range of integrated electric fence packs for all our Rappa fencing machines. All use products that work together seamlessly, and connect easily to make longer fence runs. 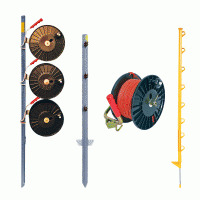 Each tried-and-tested pack contains the correct number of steel or polystakes, a reel post, anchor post, adjustable insulators, and up to 600m of galvanised stranded steel wire or polywire, prewound onto reels. 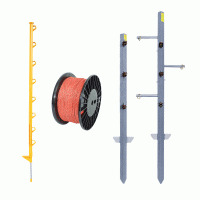 Everything you need to erect an electric fence quickly and easily. Use our all-steel packs for semi-permanent electric fencing that will stay in place for several years. We've galvanised our steel stakes to prolong their life and prevent rusting, while the stranded steel wire is galvanised to BS443a, making it a perfect conductor with little or no voltage drop over long distances, and offering maximum durability and longevity. Our lightweight fence packs are designed for temporary electric fencing, particularly for strip-grazing or winter break feeding. All use our unique Superlite stake, the toughest on the market and, to our knowledge, the only one to carry a two-year guarantee. We've teamed it up with our heavy-duty six-strand polywire, combining strength with high conductivity. While electric netting will keep rabbits away from crops, it's only practical for small areas. With lost crop costs running into thousands of pounds on many farms, farmers and horticulturists with larger fields need a more robust solution. Designed in association with universities and DEFRA bodies, our rabbit electric fence packs are economical and highly efficient in deterring rabbits. Both incorporate long-life galvanised steel wire, a better conductor and more resistant to vermin damage. By fencing a field completely, you can virtually eliminate crop damage; alternatively, use a strip-fence to control an attack on a specific area of headland. For cereal crops, use a four-line electric fence. For greater control for vegetable and horticultural crops, choose the six-line version. Erect the fence soon after sowing and leave it in position until crops are strong enough to withstand rabbit infestation. The range includes a economy pack along with two line pony and horse packs. 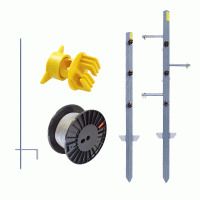 We also supply fence gate packs.